On the whole, there is nothing particularly notable about Pigskin Parade and its plot. 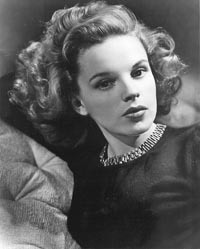 The movie, nevertheless can be distinguished as earning a Best Supporting Actor Oscar nomination and being Judy Garland‘s feature film debut. Although the young woman had appeared in some short subject spots on the big screen, this was her first real picture. The movie is a musical of sorts with only moderately notable songs, but Garland sort of knocks you over with that mature voice and such innocent and immature face. Garland does not arrive until at least a third of the picture through. First, Yale University will accidentally chose Texas State University –instead of the intended University of Texas– for a charity football game that is of great importance to the school. They do not want a team that is too skilled but also do not want the tiny state university whose team is no contender. TSU happens to have just hired a new coach coming off a successful high school job. This Slug Winters (Jack Haley) brings with him wise-cracking wife Bessie (Patsy Kelly) and is immediately in over his head. He soon teaches the team, which is primarily made up of great basketball players, to play football like the other sport. All is great until Bessie injures the star quarterback. Luckily for Bessie’s neck, she stumbles upon a redneck who can accurately chuck a watermelon an incredible distance and has large feet great for running and kicking as well. This Amos Dodd (Stuart Erwin) agrees to enroll in the university on the promise of pretty girls. He brings with him kid sister Sairy (Garland) who wants to get some proper singing lessons. The football team again becomes a hit although the interference of a certain college co-ed (Arline Judge) makes Amos unsure he wants to stick around. The team heads north for their game against Yale and the players find themselves in a snow storm. Nevertheless, the team predictably prevails. Pigskin Parade is marked by entertaining musical numbers not only by Garland –whose character is repeatedly offering to sing for people only to be turned down until the movie is more than half over– but by the Yacht Club Boys and their original ditties. This group of men are great singers and wonderfully expressive making their performances eye-catching. The songs contained in the picture are nothing to write home about, but they are well delivered. Garland gives a cute performance as a dirty country bumpkin, crinkling her nose and talking in broken English. It is Erwin who earned the Oscar nod playing an even more ignorant Texan than Garland. He is entertaining but there were certainly more deserving performances in 1936. Pigskin Parade is set for 10 a.m. ET April 22 on TCM.